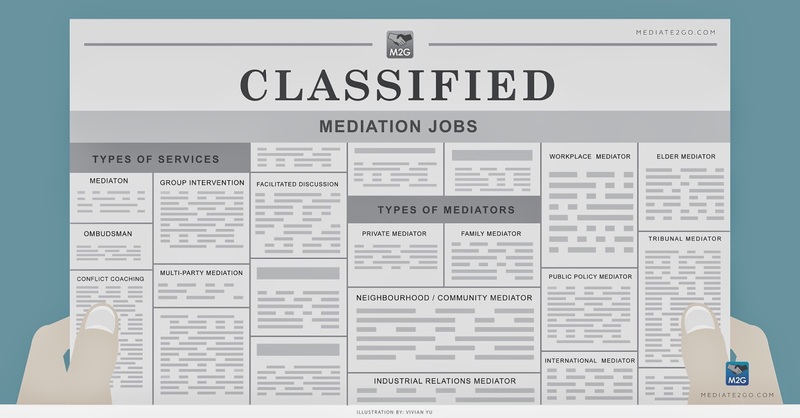 You are looking for a job as a mediator? You have come to the right place! Mediate2go.com offers some of the best tools available to help you start and build your mediation practice from the ground up. Best of all, we make this free or extremely affordable so that your dream of becoming a mediator can come true. 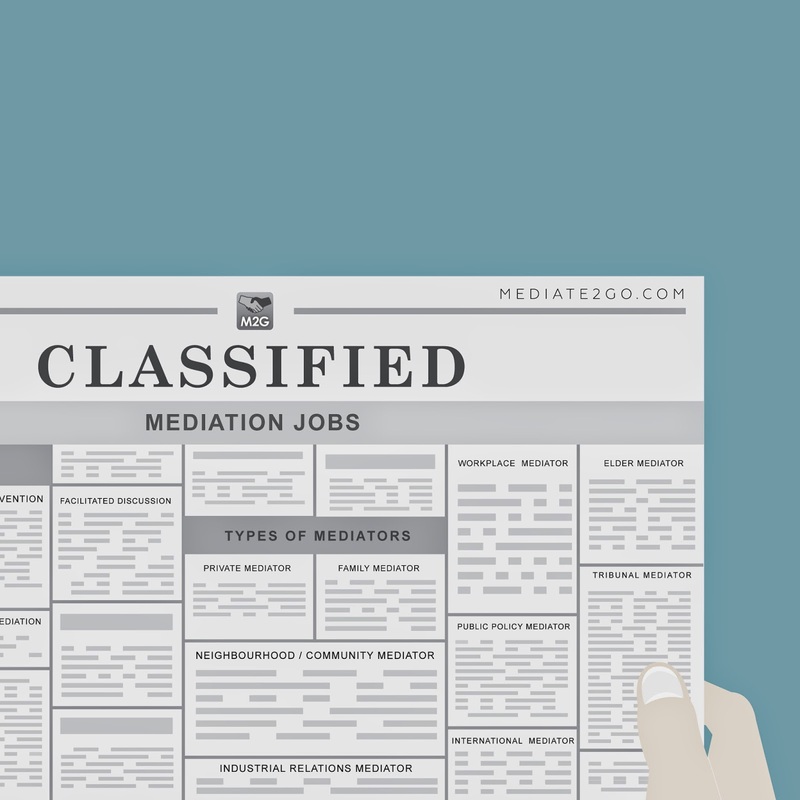 Whether you are just beginning your career in mediation or going further in your path as a third-party neutral, this article will provide information about jobs in the field of mediation. Also, be sure to visit our article on "How to Become a Mediator". Mediation is a practice where a third-party neutral is asked to provide a neutral and impartial service to two or more disputing parties. Mediators do not make a decision as to the outcome of the dispute, but rather focus on helping the parties communicate so that they may find their own solution based on their deeper needs and interests. Mediators are obliged to respect the confidentiality of the discussions mediation in addition to their client's confidential information. This is just one reason that mediation is chosen as an ideal way a result they a conflict; it allows for creative outcomes outside of the public realm. If the parties have found an agreement, each will sign what is known as a "Settlement Agreement", which details the outcome of their agreement, which may be used by one of the parties in court if the agreement is not respected. To develop expertise in this area, see our document on "How to Become a Mediator". Conflict coaching is now popular practice that is offered frequently as a substitute or compliment to mediation. Conflict coaching provides the means for and individual to try to resolve a conflict on their own, with the help of a conflict resolution practitioner, known as a conflict coach. Very often, mediators might also be trained in conflict coaching, as these skills can be very useful in preparing clients before and during mediation. Similar to mediation, conflict coaching is confidential and the coach does not make any decisions with regards to the outcome. Conflict coaching is very popular because it can better prepare parties for mediation, but it can also help parties decide whether they want to attend mediation in the first place. With the help of a conflict coach, it might not be necessary for a party to attend mediation, as they might gain the skills to resolve the conflict on their own. Some clients also use Mediate2go.com to self-resolve their conflicts. Mediate2go.com has everything you need to become a successful conflict coach, from marketing your brand online, managing client intake, managing conflict coaching cases and more! 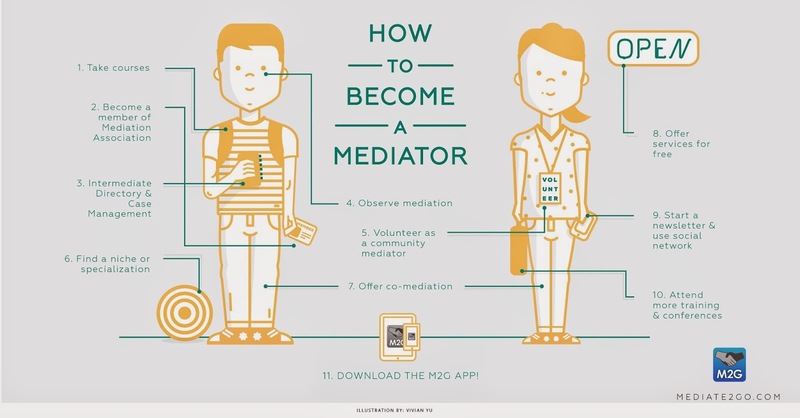 To develop expertise in the this area, see our document on "How to Become a Mediator". Also, remember to focus your searches on “Conflict Coaching”. Some individuals only offer conflict coaching services, and not mediation. While this training may be expensive, there are many books that might prove useful. A multiparty mediation is a mediation process where multiple stakeholders are brought into a process to resolve their disputes. Similar to a regular mediation, the mediator and all parties must respect confidentiality, in addition to the principles of impartiality and neutrality. Frequently, multi-party mediation is used during environmental disputes, which involve many different stakeholders, such as community leaders, industry, nonprofit organizations and others. To develop expertise in this area, see our document on "How to Become a Mediator". Focus your search on mediation related to community and international conflicts. A facilitated discussion is an informal means of encouraging communication between two or more parts by a neutral and impartial facilitator. This type of intervention/practice is different from a multiparty mediation in that the parties are unlikely to sign a formalized "settlement agreement". Rather, the facilitator will focus on helping the parties brainstorm to resolve their issues informally through communication. To develop expertise in this area, see our document on "How to Become a Mediator". Focus your search on facilitation. While this training may be expensive, there are many books that might prove useful. A group intervention is frequently used within organizations to address various different issues, for example, issues related to harassment, morale, productivity, leadership and group dynamics. A group intervention is a means of intervening within a team environment with the help of the neutral and impartial third-party, very often a mediator and/or conflict coach. Within a group intervention, the practitioner designing the process is very likely to use other types of practice (like mediation and conflict coaching) in order to address the group's issues. For example, the intervention might include various conflict coaching sessions with certain members, possibly an assessment of the groups issues (which may include interviews), and a facilitated discussion with the group to brainstorm and find solutions to their shared concerns. Group interventions are much more complex and require a great deal of prior training and care in delivery. To develop expertise in this area, see our document on "How to Become a Mediator". Focus your search on “Workplace Interventions”, “Group Interventions”, “Team Interventions” and “Human Systems Intervention”. While this training may be rare, contact your local mediation association and look for professionals in other areas. An ombudsman is a third-party neutral, which investigates organizational or public complaints. Although an ombudsman might provide recommendations at the end of the dispute, they frequently use many of the tools that and mediator use in their processes. For example, once an ombudsman has conducted fact-finding to discover the facts of a given complaint and the perspectives of each party involved, they might conduct a facilitated discussion between the parties in order to discover what went wrong and what can be changed in the future. In addition, they might also discuss appropriate remedies. If you're interested in conducting investigations, this type of job might be the best for you. To develop expertise in this area, see our document on "How to Become a Mediator". Also, be sure to visit the website of the International Ombudsman Association. Now that we have discussed the various types of practice that are offered by mediators, we will share with you some different subject matter areas of dispute. To begin, most mediators work within the private sector, setting up their own sole- proprietorship or small business and offer mediation to clients based on demand. Private mediators manage their entire business on their own, which is why many use Mediate2go.com to help them accomplish this task. Private mediators may practice in various fields of mediation, including family, workplace, civil and commercial mediation. To get a mediation job as a private mediator, we recommend that you sign up for an account with Mediate2go.com to start promoting your services. Many private mediators use Mediate2go.com to set up their own practice in mediation because it only takes a few minutes to have a directory listing, which can generate a great deal of new clientele. In addition, Mediate2go.com is the best and most affordable case management system empowering mediators to run their whole business of their mobile device. Mediators might also be specialized in providing services to the community, such as through community mediation clinics. Community mediation generally addresses conflict between neighbours. Very often, community members from various different backgrounds have been trained to provide these services, and do so on a voluntary basis. However, a job in mediation might be possible in this area as a mediation case manager or program organizer. Now, these roles can be mostly fulfilled with software like Mediate2go.com. To get a mediation job as a community mediator, visit the Mediate2go.com Directory to see if a clinic is offering services in your area. Also, search for community mediation or community clinic in your search engine. A new area of mediation is to deal with increasing disagreements related to pets and animals. This is no surprise, given that pets are such a part of many people's lives. Debra Hamilton Hamilton Law and Mediation new video series Barking up the Right Tree. This is no surprise to me, given that I was able to observe a public policy mediation process in the Netherlands that, in part, dealt specifically with the municipal issue of dog droppings. This seemingly minor issue escalated to a community-based conflict that needed to be addressed by a public policy mediator. Other clinics deal with other types of pet related conflicts, such as issues related to noise to what to do with a pet when a family separates. Please see our blog on Peer Mediation. This type of mediation is distinct from Peer Mediation, which encompasses not only peer mediation (student mediators) but especially complex disputes in special education (between parents and school districts), truancy mediation (parents, schools, kids and the courts) and restorative justice (juvenile and/or victim-offender situations). This mediation often requires higher practitioner skill levels, in comparison to peer mediation, which may be conducted by new peer mediators or fellow students. This area is especially big in the United States. 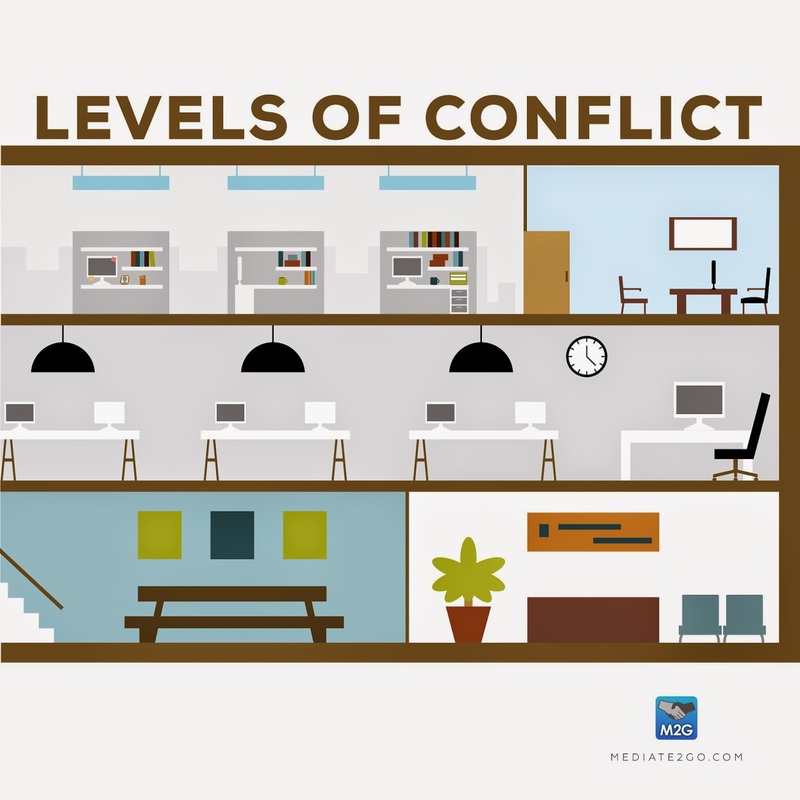 A workplace mediator resolves intra-organizational conflict, which means conflicts within an organization. While many organizations do not invest and hire full-time workplace mediators, some government agencies have decided to do so based on the various benefits offered by these services. Mediation in the workplace can increase collaboration within an organization between employees and managers, departments and teams, which can help an organization achieve its goals. In addition, mediation can help organizations save a great deal of resources which may be lost due to unresolved conflict, such as the cost of training new employees, settlements and litigation, low morale, low productivity and more. To get a mediation job as a workplace mediator, we recommend contacting various organizations to see if they have an internal mediation department or ombudsman service. In terms of training, we recommend getting as much training as possible in organizational systems, human resources, industrial relations, organizational health and well-being, organizational change, facilitation, workplace interventions and labour studies. In addition, we recommend that you sign up for an account with Mediate2go.com to start promoting your services. Many private mediators use Mediate2go.com to set up their own practice in mediation because it only takes a few minutes in order to have a directory listing, which can generate a great deal of new clientele. In addition, Mediate2go.com is the only case management system that makes it possible to manage their whole practice on their mobile device. Some practitioners specialize in designing, developing and implementing systems to resolve conflicts within and outside of public and private organizations of all sizes. These systems are often set up to deal with organizational related issues that are commonly faced within a particular field or industry. These systems might also address Ombudsman complaints, although this it not always common based on ethical concerns related to neutrality and impartiality. In addition, Conflict Resolution System Designers might also design systems to address mass complaints, such as in the cases of disasters (man-made or natural disasters) or foreclosures in the case of economic decline. Mediate2go.com can help you design and set up your conflict resolution system within minutes. We have the forms and everything prepared for you, or you can upload your own custom forms in seconds. A family mediator works with families that have decided to separate and/or divorce. These mediators are very frequently trained in the law and ideally social work, psychology and/or family studies, based on the sensitive nature of the disputes they help resolve involving children. For example, family mediators are often required to help the parties decide what is in the best interests of the child, in terms of what will happen during and after the separation and/or divorce. If the mediator has a great deal of training in this area, they will be better prepared to ask the important questions and play a role to ensure a fair process. To get a mediation job as a family mediator, we recommend that you check to see if your regional government subsidizes mediation services for families. If so, it is very possible that they might have a roster program, which might even subsidize or pay for family mediation sessions. It is the case, you might be able to get a great deal of clientele based on governments listings or referrals. In addition, sign up for an account with Mediate2go.com to start promoting your services online, as a government directory isn’t enough. Many private mediators use Mediate2go.com to set up their own family mediaiton practice because it only takes a few minutes in order to have a directory listing, which can generate a great deal of new clientele. In addition, Mediate2go.com is the best to help you start this new venture helping families move on in their lives. Public policy mediation a similar to individual mediation, however there are multiple stakeholders creating numerous relationships, and the issues to be resolved are often on a much larger scale, which the process much more complex. For example, a municipality might find a public policy mediator to help them develop new policies and regulations related to some type of problem that a community faces. Or, for example, a public policy mediator might be called in to facilitate a discussion to help resolve a contentious issue within a larger group within a community. To get a mediation job as a public policy mediator, it is in asset to have a background in urban planning, environmental studies, political science, energy or engineering in addition to mediation. Some firms and organizations have specialized within this area, although it is more common for mediators to develop their own business and practice based on how new this particular subset of mediation is. In addition, we recommend that you sign up for an account with Mediate2go.com to start promoting your services. Many public policy mediators use Mediate2go.com to set up their own practice in mediation because it only takes a few minutes in order to have a directory listing, which can generate a great deal of new clientele. Mediate2go.com makes it easy to keep track of multiple parties in a mediation process. International mediation aims to address international situations and often crisis with the help a third-party neutral practitioners. For example, a government might hire an international mediator to help resolve international conflicts between two disputing parties representing different states, all behind closed doors, without any members of the public knowing. In addition, some family mediators deal with international child abduction cases, which becomes an international mediation given the dispute must be resolved across borders. To get a mediation job as an international mediator, it is common for practitioners to have a great deal of international and diplomatic experience. Very frequently, they are public figures that might be retired and offer these services given the respect and credibility they have in the eyes of the public. However, this is not always the case. Now, many private institutes offer international mediation services, in addition to international organizations, such as the United Nations and national aid organizations and departments (see for example http://swisspeace.ch, http://unitednations.org, http://dialogueadvisorygroup.com). In order to work within this field, we recommend volunteering with such organizations and developing as much experience in international conflict resolution as possible. Sign up for an account with Mediate2go.com to start promoting your services. Very frequently, administrative tribunals offer mediation services in order to assist in the dispute resolution process for private and public parties in conflict. For example, if citizens have made complaints to housing or employment tribunals, they might have the option to seek mediation services offered by that tribunal. In addition, mediation services might be available in various other areas, such as with complaints related to social assistance, employment insurance, workplace health and safety, discrimination and others. To get a mediation job as a tribunal mediator, be sure to contact various tribunals in your region to determine whether they offer in-house mediation services. If so, you might be able to work full-time as a mediator. In addition, we recommend that you sign up for an account with Mediate2go.com to start promoting your services, given that this can increase your credibility when applying for a position. A mediator in the field of industrial relations focuses on mediating disputes between unionized employees and management, most frequently in the case of collective bargaining, where employees and managers must negotiate a new employment contract (collective agreement). In addition, these mediators might also be requested to provide services in the case that there is dispute related to the collective agreement. To get a mediation job as an industrial relations mediator, we recommend that you check to see if your regional government provides these services as part of its programs related to labour. If so, you might be able to apply directly to work as a labour-management mediator. This is another field where mediators are frequently chosen from well-known and retired judges or lawyers who have a reputation in their respective field. However, positions might be available for mediators that do not meet such criteria. In addition, we recommend that you sign up for an account with Mediate2go.com to bolster your credibility as a third party neutral. Elder mediation is a service provided to families to address issues related to elder care, such as the care of parents and grandparents. This particular subset of mediation is growing extremely fast due to the rapidly aging population. Similar to mediation within the separation and divorce context, elder mediators are recommended to have a background in social work due to the sensitivity of the issues their clients face. To get a mediation job as an elder mediator, we recommend that you gain as much experience as possible with diverse families and take as many courses as possible in related fields in addition to conflict resolution. Given the fact that this field is very new, we recommend that you also join international and local organizations that specializes in this type of mediation, considering that it might offer specialized training in this area (see: http://www.eldermediation.ca and http://elder-mediation.com.au). In addition, we recommend that you sign up for an account with Mediate2go.com to start promoting your services. Additional commentary and suggestions were provided by the Texas Association of Mediators.